Originally established back in 1606 under a Charter granted by King James I, the Dover HarbourBoard is a statutory body responsible for the administration, maintenance and improvement of the harbourfacilities �]including fire safety �]for the huge 240 acre site, much of which has been reclaimed from the sea. "Yet nothing stands still," confirms maintenance supervisor, George King, "and the past fifty years in particular have seen huge changes, with both continuing growth and a major shift in emphasis in terms of passenger and commercial traffic." The 1950s saw the first drive on�]drive off ferry berths, followed a decade later by roll�]on, roll�]off freight. In the past decade the Port has also diversified into cruise shipping and cold storage cargo. Managing such a large and diverse site has major implications on fire safety, which periodically has had to undergo similarly far�]reaching transformations in order to reflect the changing demands of the commercial environment. In 1984, for example, with the development of larger terminal buildings, the HarbourBoard moved from a passive to a more intelligent system of fire protection and over the next five years introduced a progressive analogue addressable system. The panels were networked �]with a conventional system providing full fire and fault protection �]and linked to a central visual display, providing point location for every building. It was in 2002 however that the most radical overhaul of the entire site's fire protection system took place. "We needed to ensure we had a system which provided adequate protection for the complete site -including the harboursand marinas �]in their present state of development," recalls King. "At the same time, it had to offer the flexibility and scalability to provide an essential level of future�]proofing, enabling us to maximise the return on such a significant investment." As a result, the HarbourBoard went out to full tender and chose independent specialists Fire Alarm Fabrication Services Ltd (FAFS). FAFS in turn selected Morley�]IAS by Honeywell using Apollo devices as the equipment best suited to the task. "We already had a very positive experience of working with both the fire systems house and Morley IAS and Apollo equipment," he says. "Equally importantly, however, they showed they fully understood the varied demands of our unique operation and together offered the most effective and appropriate solution going forward." The demands on fire safety provision at Dover are wide�]ranging. The HarbourBoard is responsible for managing the Western and Eastern Docks situated two miles apart, including a wide array of passenger and freight buildings, from cruise and ferry terminals to immigration holding areas to cold stores. The buildings, manned and un�]manned accommodate visitors and staff and include car parks, an IT centre, high voltage sub�]stations, workshops and storage areas containing hazardous materials, all with their own individual fire protection requirements. In addition, the Dover HarbourBoard is landlord of a large number of Georgian flats and apartments along the seafront and it has to manage a large number of listed buildings. Following the review, the Port was sub�]divided into four sections, each supported by a separate loop using fully addressable Morley�]IAS ZX control panels and using Apollo Discovery protocol devices. The system in total incorporates 41 panels. Ranging from the smaller single�]loop ZX1E to the ZX5E 5�]loop formats for the large terminal complexes. The control panels support over 2,300 devices making it one of the largest installations of its type in the UK. Unusually, as the site has a French customs area, this also includes multi�]lingual voice�]enhanced sounders. A P1 system is adopted for those parts of the Docks complex which is unmanned for any period of time, with the highest category P1/L1 system for public buildings. In order to accommodate the diverse range of applications across the site, the solution includes optical beam, ionisationand aspirating systems. The fire protection system includes seven miles of network cabling, which are a mixture of copper and fiber optic cables. Transient protection has been fitted to the panels where relevant and every device is monitored round the clock, with any loss of signal immediately investigated. The whole network reports through to the police station situated at the edge of the Eastern Dock. "For Dover Docks," says FAFS Sales Manager, Terry Davies, "the reputation of both Morley�]IAS and Apollo in providing industry�]leading levels of reliability was critical in protecting such a hard�]worked yet sensitive site. "Equally, one of the biggest challenges was to accommodate a wide range of detectors, some of which were up to 15 years old. Here too, Morley�]IAS panels' unique backwards compatibility has enabled us to deliver a highly cost�]effective solution. At the same time, the Docks provide a hostile, corrosive environment and the chosen solution had to be suitably robust to withstand the pressures of the natural elements associated with its coastal location," he adds. King points to another reason why Morley�]IAS's proven durability is constantly put to the test. "Our security staff are fully trained to deal with the hugely�]fluctuating numbers of people using our facilities each day, particularly in the cruise terminals which may stand empty for some time and then have to cope with 2,000 passengers," he says. "However, across a large site undergoing constant refurbishment, problems can arise if contractors stray beyond their controlled areas or the agreed programme of work for example. The Morley�]IAS panels' ability to isolate down to an individual device means we can precisely define the area in which maintenance or development work is to be undertaken and put in a temporary firewatch." 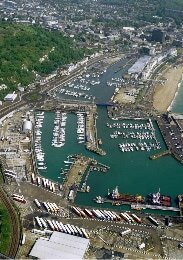 Another strength of the Morley�]IAS system which made it particularly well�]suited for the Dover Docks' application was its user�]friendliness. The network is constantly monitored at three locations and, says King, "the panels are clear and concise and the system simply ‘holds your hand' throughout its operation, making it very easy to use. This is important for our fire managers and operating staff, who can see at a glance where potential problems have arisen, using its full fault reporting." Key to the effective management of any fire risk, particularly in an environment with a large number of people and high volume of traffic spread over such a wide area, is to have in place safe and tightly controlled evacuation procedures. Here the Morley�]IAS�]based solution provides effective support through its pre�]alarm functionality. This isolates the area at risk and enables fire staff to check out the potential problem and restrict the area subject to evacuation, so minimisingdisruption. Since its introduction, King has been pleased with the performance of the new system, which has provided the level of reliability and effectiveness required. In order for this to be achieved, of course, maintenance has to be of an equivalently high order and in this regard FAFS has proved equally impressive. As part of Dover HarbourBoard's detailed monitoring process, FAFS' fully accredited engineers use laptops to record all service and maintenance activity. "This gives us 100 per cent confidence that the checks have been carried out properly," confirms King. "At the same time, the FAFS team is highly responsive to our enquiries, delivers comprehensive training for our staff and provides us with valuable proactive advice and support in ensuring our systems are fully up�]to�]date and appropriate to our needs." As part of the Dock HarbourBoard's long�]term plan, future developments include the expansion of its ferry business. "We operate in a highly volatile market and the only thing that is guaranteed is change," says King. "However, with the Morley�]IAS and Apollo system in place and the on�]going support of FAFS, we have a fire protection system with the resilience and flexibility needed to respond to whatever demands are placed on us in the future."